Day Sailing in the San Juans; heading into Wasp Passage with Mt.Baker in the distance. 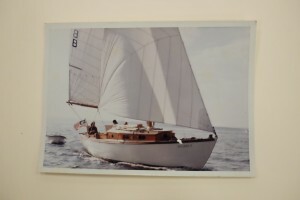 “Aura” sailing, back in the day. One of the great things about owning Aura is her historical significance. 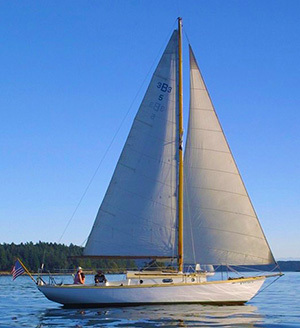 She was built in the heyday of wooden boat building in Seattle. Few people are left who remember how it was then. Norman C. Blanchard was in the thick of it from an early age. I got to know Norm and his second wife Mary, a bit in the mid 1990’s. He was then 85 or so, and very approachable and gracious. He didn’t want to talk about the boats as much as he did the people, as befits a legendary boat salesman. His book of memoirs, ‘Knee Deep in Shavings,’ describes those days. His Dad, N.J. Blanchard, was the old-time shipwright from England, who started his own shop on Lake Union after WWI, and kept it going until he died in the early 1950’s. By that time, fiberglass boats were eclipsing wooden ones, and the old man didn’t care to change to the new production methods. Norm told me that when his Dad died, people didn’t think “little Norm” could keep the business alive, but he did as well as could be expected, doing mainly repairs rather than new boat construction. Blanchard sold out in the early 60’s, shortly afterward there was a fire at the plant, and it closed. Norm was full of stories. 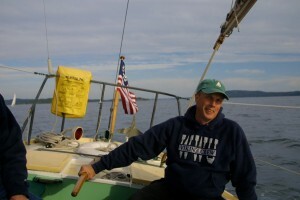 When he was a kid, hanging around the boatyard, his idol was Ted Geary, the great Naval Architect then based in Seattle. 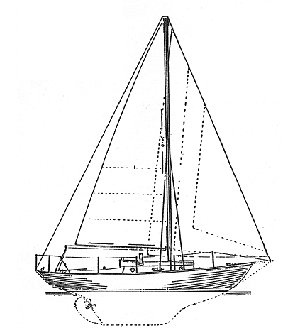 Geary’s design for an R-class boat, Sir Tom, was very successful on both coasts in the 1920’s, with Geary at the helm. Norm’s Dad was part of the crew, and Norm Jr. was the little mascot. 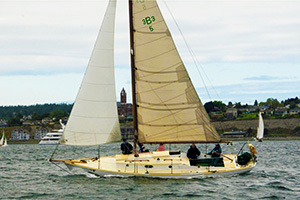 Another Blanchard-built, Geary R-boat, Pirate, can be seen today at the Center for Wooden Boats at the south end of Lake Union. Pirate has Sir Tom’s mast. Norm was a very active young sailor. When he was courting Eunice, his wife to be, and she lived in Ballard, he would sail his Star boat there, down the Ship Canal to pick her up. One day he was running late, and the Fremont Bridge, clearance 30 feet, was lowered for car traffic, and large sailboats could not get under it. So since the wind was strong on the nose, he leaned the boat way over, and sailed to windward under the bridge. If had needed to tack directly under the bridge, the mast would have snagged it. But the Star went upwind well: with the current, Norm cleared the bridge, and zig-zagged his way up the narrow channel to meet Eunice. 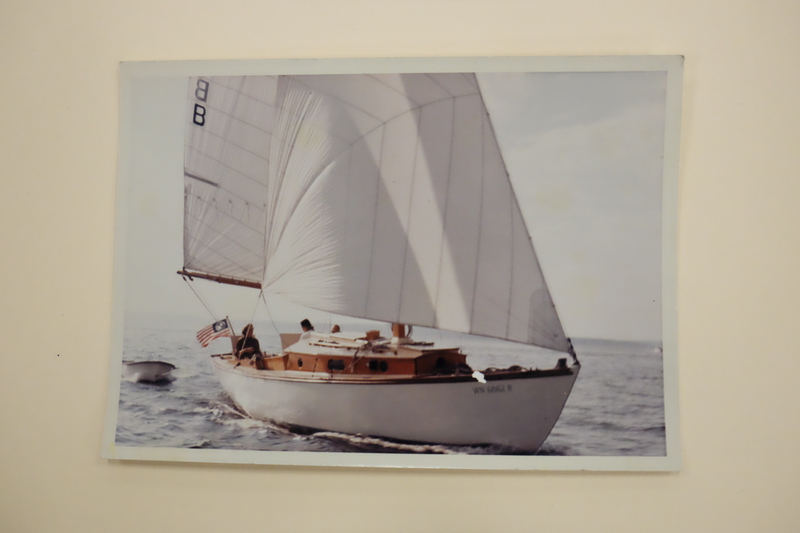 Another great story was when Blanchard Boat Co. had a contract to build an Atkin Ingrid to compete in the Ingrid fleet in Los Angeles. William Atkin sent the offfset plans, and one of the lead shipwrights, an old Scot who had worked for the Fife Company in his youth, took a look at them. He pronounced the boat un-buildable according to those offsets, and that it would turn out “lumpy” and slow. He made some modifications to the plans, and the boat was built that way. When Mr. Atkin found out that his design had been adjusted, he made it clear he would have nothing to do with it, that it was not a true Ingrid. The boat went to LA, and promptly dominated the Ingrid racing. The other Ingrid racers said when all the boats were hauled out and standing in a row, it was visible why the Blanchard-built one was faster, it being a little bit sleeker. When I met Norm and Mary a few years after I bought Aura, it was at the CWB Festival on the July 4th weekend. They invited me for lunch at the Seattle Yacht Club, where Norm had more seniority than anyone, having joined in the 1920’s when they had junior memberships. Norm was an accomplished woodcarver, and showed me the half model of Aura he had carved in the 1950’s, painted light green, with the other half models on the wall of the upstairs club restaurant. He also carved Aura’s name-board, which is still mounted on the boat. A few days later, Norm and his old friend, a retired UW professor, accompanied me on my delivery of ‘Aura’ back to Bellingham. The plan was to get as far as La Conner, where his daughter would pick them up. We departed Lake Union early in the morning, and cleared the Locks. I remember him reassuring me as we passed under the closed railroad bridge, that there was more room over the masthead than there seemed. We got into the salt water, and it was a beautiful sunny summer day, with no wind. We motored down Puget Sound, past Everett, and into Saratoga Passage, where at last the wind came up, but it was in the wrong direction. We sailed anyway to windward, and it was very pleasant. The wind built, until the chop in the passage slowed our progress to the point that even motor-sailing we couldn’t get much more than 2 knots, so we turned downwind, and flew back to Everett. It was just as well, because it was probably the last time Norm drove a sailboat hard into the wind, getting spray on the face. He loved it, and wasn’t complaining, but I could see he was tiring. We had a nice dinner at the Anthony’s there, where his friend, being Italian, described to the waitress how he wanted his pasta ‘al dente’. Norm’s daughter came by and they drove away. He mentions the trip briefly in his book. The next time I saw Norm was a few years later, when his book had come out, and he was signing copies. I had him sign my copy. He didn’t remember me. But I still remember him.